RIM’s first BlackBerry 10 smartphone will launch during the first quarter of next year when the company finally releases its brand new operating system. That device is largely expected to be part of the L-Series family and is currently code named London. We’ve seen the phone torn open and already have a general idea of what it will look like. Now, an alleged specifications page for the London has been leaked, and it gives us a better idea of what the phone will offer consumers. 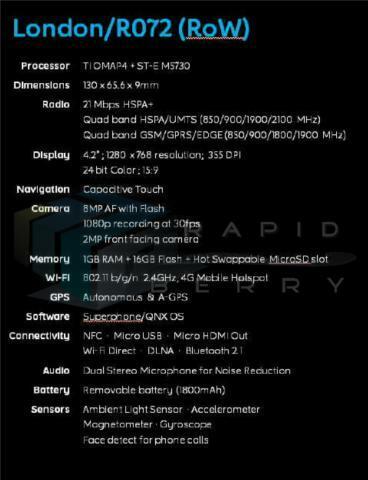 According to an image published by Rapidberry.net, the London will ship with a TIP OMAP 4 processor, support for 21Mbps HSPA+ networks (and likely LTE here in the U.S.) and sport a 4.2-inch 1280 x 768-pixel resolution display. It will also offer an 8-megapixel camera capable of recording 1080p HD video, a 2-megapixel front-facing camera, 2GB of RAM, mobile hotspot support, NFC and microHDMI-out. Of course, none of the hardware will matter if the software falls flat, so here’s to hoping BlackBerry 10 ships with tons of applications and an amazing user experience.